There is now $3.8 million available for climate change projects in Victoria. The Climate Change Innovation Grants will support organisations to develop innovative solutions to the challenges of climate change. 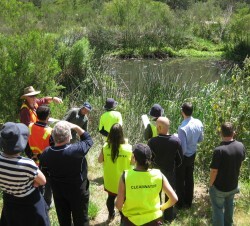 The program will be open to projects from across regional Victoria, Melbourne and surrounding areas. If you're a local business, research organisation, educational institution, community, local government (collaborating with partners) or non-government organisation, you are encouraged to apply. To register your interest and get further information please email vccci.info@delwp.vic.gov.au.